Ideal Motors and Takas have announced their tie-up to offer online booking of Mahindra e2O. Mahindra & Mahindra Ltd., a part of the US $20.7 billion Mahindra Group, has always emphasised the importance of Sri Lanka, as a one of the key focus markets. The tie-up of its partners – Ideal Motors, with Takas is a step in its direction. Ideal Motors is the sole franchise distributor of thee Mahindra two-wheeler, three-wheeler, passenger, commercial vehicle segments in Sri Lanka. This will allow Mahindra & Ideal to further reach out and connect with its customers and provide them the ease to book Mahindra e2O, the electric passenger car. Mahindra’s fully electric passenger car, the “Mahindra e20” is the green answer to city mobility. It is an ideal, economical city commuter car for small family of four. Its two door provides safety for small children sitting at the back. The interior leather quality is impressive for its size, while legroom remains good within both rows. The e2O is a car of the future with the ability for the driver to enable several features from a handy app on their smartphone. These include: remotely locking and unlocking the car from anywhere; turning the air-conditioning on and off; and even remotely diagnosing the car’s health and battery levels. The app also allows drivers to tap into a reserve (power), in case the power runs out before the car reaches a power outlet and provides up to 10 kilometres of extra distance. e2O generates 3 phase induction motor that produces 31KW @ 3500 rpm and maximum torque of 91NM @ 3000 rpm. All this allows the vehicle to reach a maximum speed of 100 kilometres per hour and 0-60 in under 8.8 seconds. There has been no compromising of safety when it comes to the e2O, which comes equipped with front and rear anti-roll bars, ABS, ESP, emergency brake assist and dual front airbags. It fully complies with UK standards and safety measures. It is also equipped with hill hold control for the ease of its driver. The car will never roll back on a slope, nor will it make driving uphill a difficult task. Packed with a whole range of options including ABS, Dual Airbags, leather interior, alloy wheels, telematics, reverse camera, the e2O is now on a special offer for only Rs 1,895,000. Better yet, an initial payment of Rs 189,500 is all that is required to drive away. 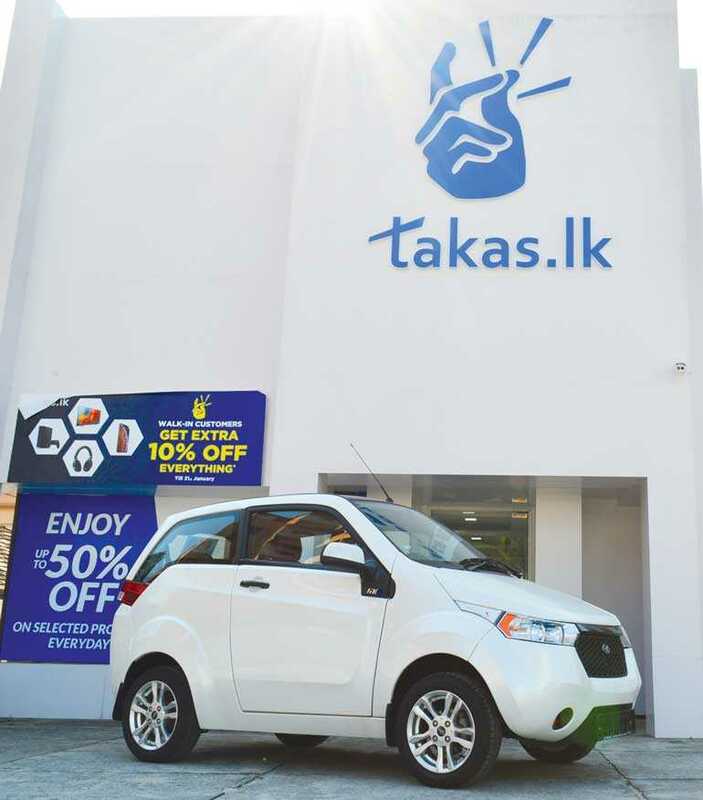 Visit takas.lk for a range of payment methods. You only need a few minutes to finish the transaction. Further, the e2O is backed by a 2 years or 40,000km warranty coupled with an unmatched after sales service via the Mahindra-Ideal Motors Island-wide network.